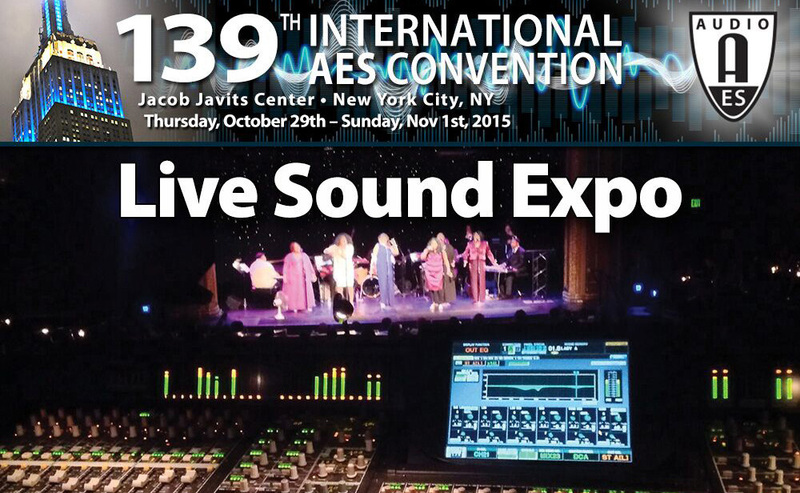 This year’s 139th AES International Convention is set to offer up a number of unique presentations and events, October 29 – November 1, 2015, at the Jacob Javits Center in New York City. 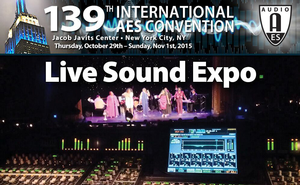 Notable among them is the return, for its second year, of Live Sound Expo (LSE), which will bring keen insight and expert advice to live sound engineers of all types, from installed sound to Broadway to touring sound. This year’s Live Sound Expo, produced in association with Pro Sound News, offers expert advice for the broad spectrum of live sound engineers – some 25% of Convention attendees – with an emphasis on practical applications covering topics ranging from live sound in theaters, music venues and houses of worship. It will address key topics such as how the changing state of wireless audio will affect professional users, how virtual sound checks and networked audio are combining to create a more efficient workflow for live sound engineers, and live sound console and microphone design and use. This second edition of the AES Live Sound Expo follows its highly successful debut at last year’s AES Convention in L.A. This year the LSE will be broken up topically across the three days, addressing important segments of Live Sound and Sound Reinforcement slated to include a “Broadway Day,” a "House Of Worship Sound/Fixed Install Day,” and a “Tour Sound Day” – each with dedicated programs consisting of presentations and panels featuring industry leaders. Sponsors for the LSE include Cadac, Clear-Com, DiGiCo, DPA Microphones, EAW, L-Acoustics, Optocore, Sennheiser, Waves Audio and Yamaha. Broadway Day (Friday, October 30) is devoted to live sound in the theatrical environment, with topics slated to include Theatrical Vocal Miking; Wireless Issues for Live Theater: Broadway and Beyond; Theater Sound System Design and Optimization; Theatrical Console Automation; Networking For Theater; and Theatrical Sound Design. The Word And Music: House Of Worship Sound/Fixed Install Day (Saturday, October 31) offers a range of HOW and venue installation presentations including topics such as Speech Intelligibility: Contributing Factors; Miking Grand Piano and Choirs; Mono vs Stereo vs LCR in HOW and Fixed-Install; IEM Fundamentals and Hearing Conservation; The Future of Wireless: Now What? ; and Modern Digital Mixing Console Fundamentals: A Practical and Ergonomic Approach.